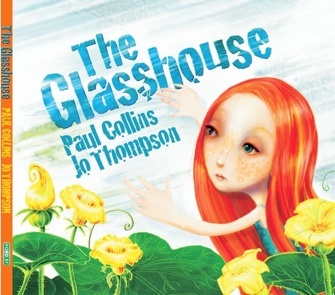 The Glasshouse is an intriguing children's picture book, written by Paul Collins, illustrated by Jo Thompson and published by Ford St (2010). Although I've reviewed other Paul Collins books, this is the first children's picture book I've read by this versatile Australian author. In The Glasshouse, Collins writes a thought-provoking story about an unusual character, Clara. It's a little like a modern fairy tale or fable, but one where we need to decide for ourselves exactly what happens in the end. This is not your average children's picture book. I would suggest The Glasshouse for primary school aged readers. It's the sort of book teachers will choose as the basis for discussions about issues like friendship, perfectionism, debilitating fears, and even environmental studies with kids. If you have a child who's a perfectionist, this book makes a fine choice for starting a discussion about the fact that perfection is not always the answer. The illustrations are special. I really like the way Thompson has not only underlined the story, but also added another visual layer for us to think about. For example, her use of focus/blurring accentuates Clara's aloneness and separation from the outside world, and the last three pages have no text at all, yet finish the tale in an immensely satisfying way. You can find out more about The Glasshouse via this animated book trailer.